We don’t usually encourage wearing lots of jewelry pieces. We prefer to keep things to a minimum and love to wear simple elegant pieces. A silver and pearl ring is just such a piece. Not only is it classic, but also sophisticated and elegant looking. We love and recommend wearing silver and pearl rings, simply because they add a little more appeal to any outfit it is worn with. Never considered buying a silver and pearl ring? Well isn’t it about time that you did, especially if you were born during the month of June as this is your birthstone. Today we decided to share our editor’s story. How did she decide to pick her silver and pearl ring? What setting did she prefer? Read more to find out everything and we hope the whole experience will help you make the happiest decision. “Hello, pearl lovers! Let me share with you a part of my personal preferences. If you are actually thinking about getting any kind of silver and pearl rings there are a few things to consider. One of the most important of these is the ring setting. How the pearl has been mounted on the actual ring could affect whether the pearl will fall off or not. Just like you when I decided to buy a silver and pearl ring I was stuck with finding the right setting. I was looking with my other half for a new silver and pearl engagement ring to replace the one I got originally. We decided to do this on our 30th wedding anniversary. My original engagement ring was beautiful but unfortunately, at some point, the small diamond in it had fallen out. I suppose I could have got a replacement diamond for it, but my wonderful husband decided he wanted to buy me a new one. I could have chosen local jewelers to find what I wanted but decided I would look online. As you can imagine when it comes to looking for a silver pearl ring online you are spoilt for choice. Not only can you get more traditional style rings but also more unique and modern styles as well. I loved that I had so much choice to choose from. I was actually more interested in a silver and black pearl ring rather than one with a white pearl. But before I began my search I started to look to see what kinds of settings were available. I was quite surprised (before starting to work at PearlsOnly.com) to learn just how many different styles of settings there are. So in order to help you choose the right kind of setting for your silver and pearl ring I am going to explain a little more about the different settings below. This is the most common setting for any silver and pearl rings. The way in which such are constructed is simple. A short pin will extend from the ring mounting and goes into the pearl. For this to happen a hole needs to be drilled into the pearl. Normally, a small amount of glue gets applied to the pet and into the hole so that the pearl can be fixed in position. This kind of silver and pearl ring will go extremely well with classic outfits, casual attires and even combined with large pearl earrings. This is the kind of setting that will help to reduce the chances of the pearl or pearls becoming loose and then falling off the mount. With this kind of sterling silver and pearl ring, several prongs will hold the pearl in place on the mount from several sides. As these offer a lot more protection for the pearls they are now becoming more popular. But you still need to be careful when wearing such, as over time the prongs could become weakened or break away and cause the pearl to fall out. This kind of pearl and silver ring will complement any elegant outfit. Moreover, it will add a touch of sophistication that will bring you many compliments and brighten up your delicate hands. Also, you could think about wearing a ring that is made from metal that is more durable. For example, you could go for a silver and gold pearl ring or a platinum silver pearl ring. As gold and platinum are stronger it means that it will take the prongs much longer to wear down, so the risk of the pearl falling out from it’s setting is much less. If you only intend to wear say your silver pearl finger ring to social events then you may want to wear one with a large oversized pearl. The pearl will be mounted in a very modest setting and may be surrounded by a few diamonds or gemstones. However, like so many other women you may find that you prefer to wear a ring where the larger pearl is surrounded by much smaller ones. This kind of pearl ring can become your statement pearl accessory. You can definitely create a signature look with the help of it. This is the setting that I favoured, as I’m not one for too many frills. I prefer to keep things simple this is because I actually wear mine pretty much all the time. I didn’t go overboard when it came to the size of the pearl, I preferred one that measured just 8mm, but you can go bigger if you want. Wearing just a single pearl with a silver band is very common as it helps to enhance the beauty of the pearl. However, you don’t need to stick with the usual white pearl you could be a little more daring and go for a different colour. Lilac or black coloured cultured pearls would look stunning when they have been mounted on silver or platinum band. So, if you are still undecided, start with this kind of design. Simple, neat, elegant…and classic! You can be sure this timeless design will never be out-fashioned. If you are on a budget and you are looking to buy silver pearl ring online then this is a great option to consider. This type of ring is made up of a cluster of small pearls only. 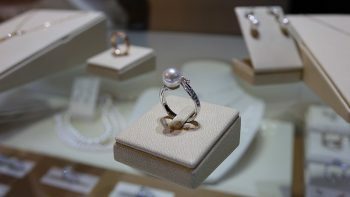 Plus choosing to buy say a silver and gold pearl ring made using cultured pearls will help to keep the price down further. Choosing to use cultured pearls means that you have the opportunity to combine various different coloured pearls together. Why not choose a clustered silver and pearl ring that has been made using beautiful silver or lilac coloured pearls instead of the more conventional white ones.